36 inch diameter by 9'2 inch long seasoning reel with (8) full-length by 2 inch high triangular lifting baffles. The coater drum sits on a stainless steel tubular frame with height adjustable feet, with a power adjustable-tilt mechanism. Trunnion driven, with 1/2 HP drive. 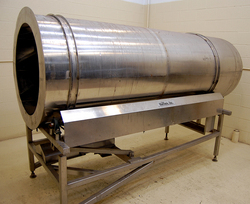 Manufacturer rated for up to 3,500 lbs per hour e.g salting or seasoning tortilla chips, and / or other snacks / snack industry products, with gentle, effective tumbling action, minimal breakage, and uniformly covered product. As of this writing, this Casa Herrera tumbler drum is in stock at Alard, in good condition, available for timely shipment. ...38 inch diameter by 48 inch straight sided, with a shallow dish bottom, with a 2.5" center bottom outlet with a threaded connection. 63 inch infeed height, 12 inch discharge height, portable on 8 inch high casters. 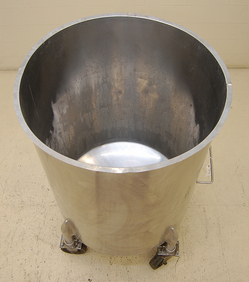 As of this writing, this portable stainless steel tank is in stock at Alard, in good usable condition, and available for immediate shipment. August 2015 is the previous archive.